Woot is the hilarious "one day, one deal" site where there is ONE THING for sale every day. Each day, a different thing. The real charm of Woot, though, is the spectacular copy-writing each day for the particular deal. Somebody has a great deal of fun with this (actually sometimes extending to an ad-hoc song connected with the product). This one made me laugh out loud today, as virtual art imitates virtual con-artistry—a parody of the myriad of "help transfer my fortune out of [insert destabilized African country] and you'll be handsomely rewarded" emails. Have a read, have a laugh and check back daily for more Woot fun! Hey! Here's your chance to make a difference in somebody's life, and find your fortune, too. You can do both of these things by leaving your own message in a Fortune cookie, courtesy of Enid's Discovery, a "community-driven artwork" on display at LexArts Gallery in February 2006. Welcome, friends to Lucy and Mick's World Wide Wed! I just put up this new blog, which is located at lucyandmick.com. This is where all our matrilicious plans will be conveyed to you, gentle reader! Salut! Friday night was The Addys, which I admit kind of snuck up on me. By Friday, after 5p, I'm usually ready to hit the couch, and I wasn't exactly wild about the prospect of gettin' fancied up and heading to the Marriott for intense schmoozing… especially consider that the invitation said "black tie" and my attire was…somewhat less than formal. I know enough to know what black tie means, but had my doubts about whether people would actually embrace this. (As the hour approached, I was really mostly interested in conclusive evidence that I wouldn't be the only one who wasn't wearing black tie. At one point, I had this idea to tie a black shoe lace around my middle finger in case anybody asked me where my black tie was. 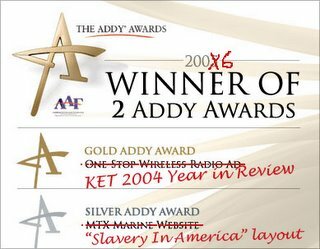 Anyway—long story short, to quote my brother—I wasn't the only one (though most definitely in the minority), and I won two Addys! I was looking for an image online of the li'l Addy trophy to illustrate my glory, and was surprised to not be able to find one; But I did find this image from somebody else's Addy victory that was close enough to mine that I got a few laughs out of just "marking it up." By the way, I had fun— I was worried that it would be a stiff drag, but I forgot that I love to schooze as much as anybody, and did my fair share. My favorite thing (that wasn't me winning a Gold Addy): trying to wheel and deal with a couple of adjacent tables to get them to swap our table a bottle of (gross) blush wine for their seemingly untouched red wine. No dice, but some good laughs. 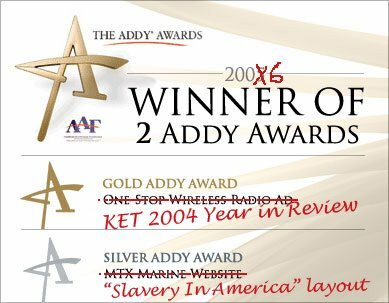 Congrats to my other KET peeps, who helped the agency take home a decent handful of awards. Also to Elevation Studios, who mopped up the place for a second year in a row. It's official, friends! 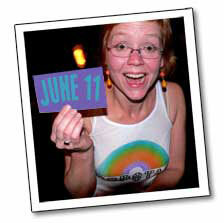 Lucy and I are getting married on June 11, 2006, in the glorious heart of the Bluegrass! While it is true that I'm at this moment working on a couple of articles for the Kentucky Cattlemen Association, that seemingly coincidental activity does not diminish the fact that auctioneering is one of the greatest and strangest abilities of human beings. And I found a web site where you can hear audio of World Livestock Auctioneer Champions for the last 30 years. If you're looking for a little pick-me-up, this is it, pardner! 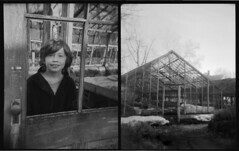 I'm having some kinda fun with my Holga camera. My second expedition with with Mr. Murphy. Click on the picture to read some more about the process. 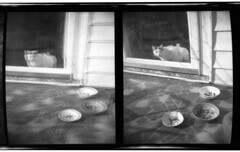 Viva, La Holga! One of my greatest xmas 2005 delights was the Holga camera that TT gave me! Yay! A Holga! But right now, I'm having some fun with it. This picture—of TT's kitty Sparkle— was taken a few minutes after the unwrapping, and followed by a trip out to the country and to one of my fave places, The Pet Cemetery. Sparkle, of course, is quite alive in this picture. And I feel alive as a photographer with my new toy camera! Look y'all! It's Lila Frances, just arrived! Jennifer and Travis had themselves a critter! Finally! The adorable and serene (at least during our visit! 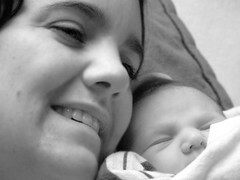 ;-) Lila Frances Robinson arrived here on Planet Earth this Saturday morning, January 7th, at about 9am.